Next time the grocer asks, "paper or plastic?" 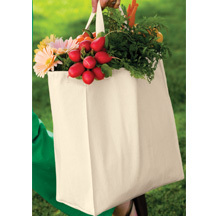 you can pull out this heavy duty, reusable canvas tote. Made from 100% cotton, the wide bottom makes it easier to fit bulky groceries, plus four sides leave plenty of room for decorating. Natural Color.